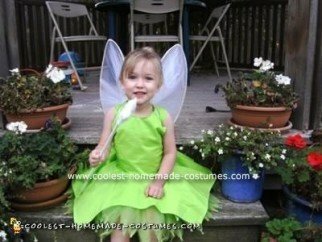 My two year old daughter came to me about a month ago, after watching the new Tinkerbell movie, and said, “Mama, I want a Tinkerbell dress!” So, naturally my mind went to Halloween. I started looking online at a Homemade Tinkerbell Costume, and I thought that I could do better. I made a tutu out of lime green tulle and beaded the end of each piece (for a sparkle effect). Then I made a simple flared dress to go over the tutu. The wings were super easy. I just took two coat hangers and shaped them to what I wanted and covered them with white glitter tulle. Tinkerbell’s wand is two of the plastic canvas stars stitched together and stuffed with cotton and bells (for a good Tinkerbell sound). I hot glued the star to the top of a stick. I made green covers for some tennis shoes and attached white yarn pompoms to finish the full effect of Tinkerbell. I didn’t have to do any hair for my daughter, she is a little blondie so it worked perfectly. I am so looking forward to Trick-or-Treating this year! What a great job! You have inspired me! Your daughter looks beautiful and you have inspired me to make a similar dress for my own little bondie! costume looks great! it looks even better than the ones I’ve seen at stores and also very unique, congratulations. The part “and then I made a simple flared dress” is where you lost me! I guess you’re a seamstress? Did you use a pattern or wing it? Zippered back or a sheath over the head? I love this costume and how different it is. Could you elaborate more on how you made the tunic part? I’m not a seamstress, but am willing to give it a shot. I would love to make this for my daughter in the next couple weeks before Halloween. It’s incredibly easy. I cut the hem in 8 points to resemble leaves. Since it’s a tee shirt it won’t ravel but it will probably get funky after it’s washed. Hopefully it will make it through the halloween season without a wash.
Wow that is soooo helpful! I was going to my friend’s costume party and had no clue what to do for the wings!